Talent. Funding. Infrastructure. Add the natural beauty and cultural diversity of Hawai‘i for creative inspiration and you have what Governor Ige and the state hope will become a “startup paradise” with a focus on technological innovation, job growth, and economic strategies to compete globally. Let’s say you have a great idea for an innovative business but don’t know how to develop it. What do you need in your business plan? How do you find investors to fund it? Where can you turn for help to connect with industry experts? The answer to all these questions is an accelerator, a boot camp for entrepreneurs who want to take their idea from doodling on a napkin to operational and investment-worthy. The accelerator provides training, mentoring, resources, and access to a network of investors. In Hawai‘i, the innovation ecosystem is taking hold, thanks to a combination of state and business community leadership, public-private partnerships, and several Hawai‘i-based investment funds. DBEDT’s Creative Lab Hawai‘i is developing immersive programs in six high-growth areas: broadband/new media; producing; screenwriting; interactive media; music; and design/fashion. From there, these creative entrepreneurs can take their ideas to the next level, to accelerators that can connect them to potential investors and industry decision-makers. Karl Fooks is president of the Hawai‘i Strategic Development Corporation, a state agency that encourages innovation through investments by its HI Growth Initiative. 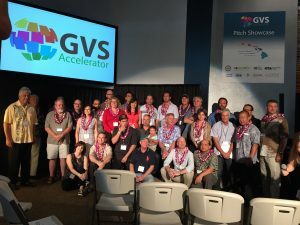 According to a report from the UH Economic Research Organization, these investments have helped start more than 40 companies that created 154 to 180 local jobs and attracted millions of dollars in private investment. Economic growth is also being nurtured in the University of Hawai‘i system through XLR8UH, a startup accelerator focusing on transforming UH’s world-class research by faculty, staff and students into viable products and businesses.“XLR8UH is a vital component of the Hawaii Innovation Initiative we’ve launched, in partnership with the Hawaii Business Roundtable,” said UH President David Lassner. To date, XLR8UH has developed 15 companies that have generated more than $600,000 in revenue and have raised $7.8 million.